The digestive system is very complex and therefore extremely vulnerable to a multitude of diseases. These include not only acute and chronic infections of the gastrointestinal tract, the liver and pancreas, but also functional disorders of the digestive system, metabolic disorders, food intolerances and tumour diseases of the digestive organs. These cause diverse complaints such has swallowing disorders, heartburn, flatulence, stomach pains, tiredness, loss of appetite or weight loss. They often first become apparent in advanced and in no longer optimally treatable stages of disease. Early awareness and the clarification of noticeable symptoms is therefore all the more important. Intestinal cancer is one of the most common and malignant diseases of the digestive tract and the third most common form of cancer in Germany. Every year, more than 60,000 new cases are recorded. The risk of intestinal cancer increases with age, so national and international professional societies recommend preventative colonoscopies from the age of 50 onwards. 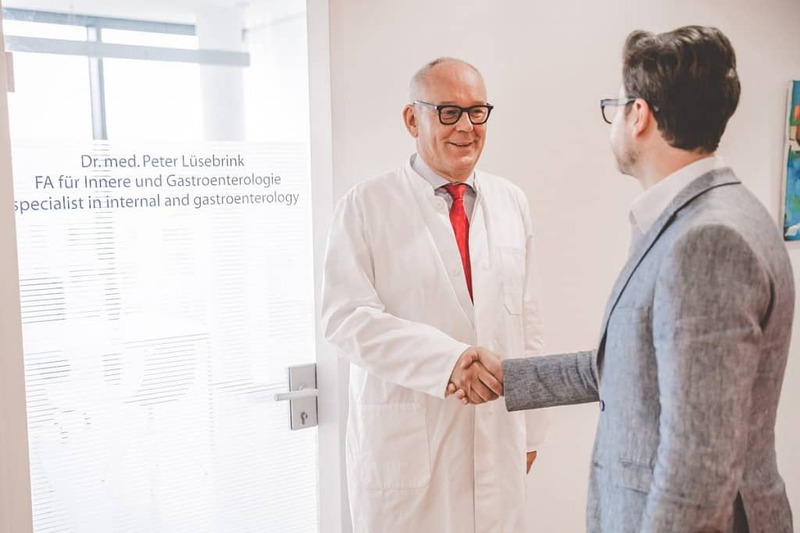 Dr. Peter Lüsebrink has many years of extensive experience in the treating of diseases of the whole stomach and intestinal tract, the liver, pancreas, gallbladder and bile tracts. The treatments are usually ambulatory and if necessary also under inpatient conditions. Endoscopic examinations are carried out using the newest high-resolution video endoscopes, different colouring processes make the interpretation of the results easier. Hygiene is of the highest standards. With the aim of achieving an optimum individual diagnosis and treatment, Dr Lüsebrink works closely together with colleagues from radiology (computer tomography and magnetic resonance imaging) and the colleagues from visceral surgery. The possibilities of treating cancer diseases are discussed on the interdisciplinary tumour board. As a long-standing chief physician of an internal medicine and gastroenterology ward, Dr Lüsebrink is very familiar with the diagnostics and treatment of the other internal organs too. Differential diagnosis of stomach pains, diarrhoea, constipation, loss of appetite, nausea, weight loss, heartburn and blood in the stool.